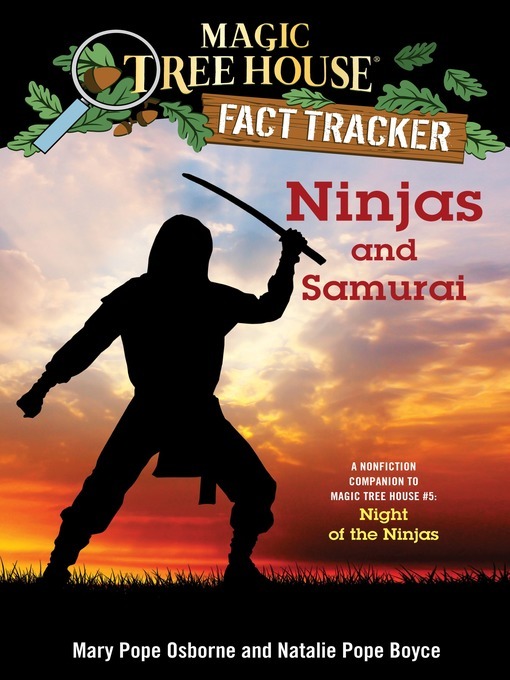 Title Ninjas and samurai [electronic resource] : a nonfiction companion to Magic tree house #5 : Night of the ninjas / by Mary Pope Osborne and Natalie Pope Boyce. Imprint New York : Random House Books for Young Readers, 2014. Osborne, Mary Pope. Magic tree house fact tracker ; #30. Summary Track the facts with Jack and Annie! When Jack and Annie came back from their adventure in Magic Tree House #5: Night of the Ninjas, they had lots of questions. What did it mean to be a ninja or a samurai' Did they really have special abilities' What was life like for them in ancient Japan' Find out the answers to these questions and more as Jack and Annie track the facts behind some of history's most intriguing and secretive figures. Filled with up-to-date information, photographs, illustrations, and fun tidbits from Jack and Annie, the Magic Tree House Fact Trackers are the perfect way for kids to find out more about the topics they discover in their favorite Magic Tree House adventures. Audience 7 years and up. Note Title from resource description page (Recorded Books, viewed June 19, 2014). Subject Samurai -- Japan -- History -- Juvenile literature. JUVENILE NONFICTION -- History -- Asia.